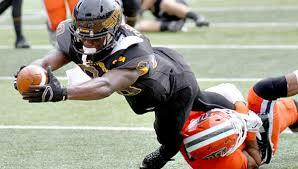 WR-Mike Thomas, Southern Mississippi, 6′ 1″ 200 lbs. Cons: The wide out has a thin frame that makes it harder for him to be an effective run blocker. He has his share of concentration issues: worried about taking big hits and miss-timing the ball in the sun. This causes him to drop too many passes and when he starts spiraling down, it is hard for the receiver to recover. Thomas only spent two years at Southern Mississippi after being a JUCO transfer, so he hasn’t faced the same level of competition that most NFL hopefuls have. There was some body catching he displayed, but that might have been about his poor quarterback ball placement more than anything. Pros: The former Golden Eagle is deceptively athletic making spectacular one-handed catches and/or kicks the ball up to himself like a hacky sack to make the reception. He is a threat to take the pigskin to the house on any play (including screen passes), averaging 11.7 yards per target. Thomas has amazing balance and body control, tracks the ball well in the air, and can run underneath deep passes catching it in stride. The wide out skyied above defenders catching the ball at its highest point, shields the ball away, and runs crisp, clean routes. Once he has the ball in his hands in the open field, the receiver uses stiff-arms, spins, head fakes, jump cuts, and his quick feet to gain separation always fighting for additional yardage. Thomas had eight 100 yard games in 2015 which are the result of his soft hands and immediate acceleration. He has decent downfield vision and is an effective kickoff returner as well. At his pro day (as he wasn’t invited to the Combine), the former Golden Eagle had a decent 4.55 40-yard dash, while showing off his explosion with a 36″ vertical jump, a 131″ broad jump, and a 4.29 second 20 yard short shuttle. Overall impressions: Thomas is a cross between NFL wide outs, Jeremy Maclin and Jordan Matthews, with their propensity for big plays and then disappearing for a while. He might be a top five rookie receiver or he could end up out of the league with his drops. I’m not willing to invest in him until at least the third round of rookie drafts.